Whether you eat them raw or use them in wine production, grapes are an amazing fruit. Knowing a few facts about grapes can help you impress friends at your next wine tasting or choose the best bunch during your trips to the supermarket. According to Dictionary.com, the word "berry" actually meant "grape" in Old English. Today, a grape is still defined as a type of berry in botanical terms. This means that each fruit comes from a single flower on the grapevine. It's natural to assume that wine is made from the type of grape that you see in your local grocery store. According to Wine Spectator, this isn't the case. Table grapes, or those you eat raw, are distinctly different. They have a thin skin, and over the years, farmers have bred them to be seedless or have very small seeds. Wine grapes, on the other hand, are smaller and have thicker skins and lots of seeds. A scientific review published in the journal Trends in Genetics reports that most researchers believe grapes are at least 65 million years old. Some of today's grape varieties are direct descendants of these ancient grapes. The review in Trends in Genetics also found that the oldest known cultivation of grapes by people occurred about 8,000 years ago in Georgia. From there, grape cultivation spread throughout Europe, and the Romans began to call different varieties of grapes by different names. According to WebMD, there are more than 8,000 different grape varieties known to scientists. These include wine grapes and table grapes, most of which originated in Europe and the Americas. The United Nations Food and Agriculture Organization keeps track of growing areas around the world and reports that 29,292 square miles of the Earth's surface are devoted to growing grapes. Top producers include Spain, Italy, China, and Turkey. Although yeast is an important ingredient in modern winemaking, grapes actually have yeast organisms growing naturally on their skins. The amount and type of yeast varies with the type of grape and its growing conditions. According to a study published in the journal Microbial Ecology, the riper the grape is, the more yeast is growing on it. This may account for why ancient people began to use this type of fruit to make wine. According to Better Homes and Gardens, grapes are hardy from USDA zone 5 through zone 9. This means you can grow them almost anywhere in the United States. However, different grape varieties are best suited to certain climates, so it's important to inquire about the best variety for your area. You can find out more about planting grape vines at your local greenhouse or university extension office. Better Homes and Gardens also reports that you can have too many grapes on a vine, which can detract from the quality of the fruit. Depending on the variety, each cluster of grapes may have between 15 and 300 individual berries. If you decide to grow grapes, it's a good idea to trim away flowers or grape clusters that don't look as healthy as others on the vine. Although many people don't associate grapes with being high in vitamin C, Self Nutrition Data reports that they actually contain more than a quarter of the vitamin C you need in a day. 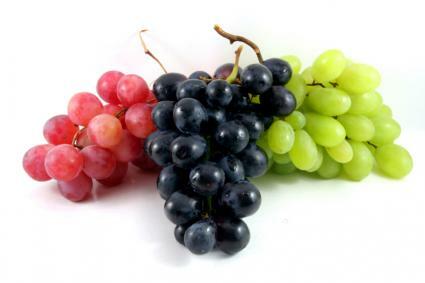 Grapes are also high in vitamin K, and they contain no fat or cholesterol. According to the Agricultural Marketing Resource Center, people are eating more grapes than they did several decades ago. In 1970, the average person consumed 2.9 pounds of grapes each year. By 2009, yearly consumption has increased to 7.9 pounds per person. 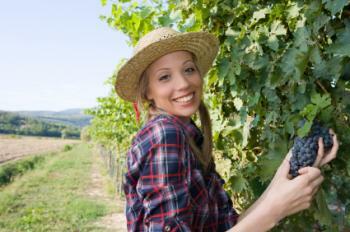 The United States Department of Agriculture reports that the US is the world's largest importer of grapes for eating. In 2012, the US imported 568,000 tons of table grapes. It requires about 90 pounds of grapes to make five gallons or about 25 bottles of wine, according to Wine Maker Magazine. That equates to more than three and a half pounds of grapes per bottle. Making wine and eating them fresh aren't the only ways to use grapes. Other uses include grape juice, grape jelly or jam, and drying grapes to make raisins. Some people also use extracts from grape seeds for medicinal purposes. According to the Guinness Book of World Records, USA resident Ashrita Furman holds the record for eating the most grapes ever in a period of three minutes. He consumed 186 grapes in that three minute period in 2011 and had to pick each grape up individually in order to do so. No matter how you use them, grapes are a popular and delicious fruit. Next time you pop one in your mouth, remember the exciting history and wonderful health benefits of these tasty little berries.